Writing steamy yet sweet compassionate stories of fate that are wonderfully romantic, Tamara Ferguson is the multi-award winning, Amazon Top 100 & #1 International Bestselling Author of the Tales of the Dragonfly Romance Suspense Series, the Kissed By Fate Series, the Two Hearts Wounded Warrior Romance Series, the Daydreams & Dragonflies Sweet Romance Series & the Tales From Dragonfly Pointe Short Story Series. Her wounded warrior romances have won fourteen awards including five Readers’ Favorite International Book Awards with Two Hearts Unbroken earning the Bronze (2018), Two Hearts Unspoken earning the Silver (2016) & Two Hearts Find Christmas earning the GOLD Medal in Military Fiction (2018.) Two Hearts’ Christmas Wish is the #13 BEST INDIE BOOK of 2017 as well a 2017 IAN Book of the Year Finalist, along with A Kiss Upon A Star. Two Hearts Surrendered was also a New Apple Romance Selection for excellence in Indie Publishing. Two Hearts Unbroken & Two Hearts Surrendered are currently 2018 TOP SHELF finalists. Along with the 2015 Romance Reviews Readers’ Choice Award Winner That Unforgettable Kiss, Two Hearts Surrendered & Two Hearts Unspoken were also finalists for the 2016 IAN Book of The Year. Tales of the Dragonfly In Tandem was a romance finalist in the Indie Excellence Awards, while Tales of the Dragonfly In Flight was a romance suspense winner at the Readers' Favorite International Book Awards. A member of the RWA, the Authors' Billboard and the Independent Authors' Book Network, her stories have been included in several #1 bestselling anthologies. Two Hearts Unbroken: Two Hearts Wounded Warrior Romance, Book 6 is a military romance novel written by Tamara Ferguson. Sarah Benton was leaving her family home once again and setting off for the next chapter in her life. When she had come home a year before, she was a fraction of her normal weight and still tormented by nightmares about her service in Iraq. It was to have been her last tour there, and then she would have taken that job offer as a civilian pilot, and she and her high school sweetheart would be married. Then everything changed: first when her twin brother was killed in action and then when she was abducted and nearly killed by insurgents. They had had to amputate her left foot after she had been rescued by Captain Brand Reardon, and her physical rehabilitation had been a long and intense process, but she still had nightmares about an ordeal her mind wouldn’t let her remember and her government wouldn’t let her talk about. And her fiance had never even called as she recovered in the hospital from her injuries. Two Hearts Unbroken is a sweet and inspiring tale about Sarah Benton’s new life in Crystal Rock, Wisconsin and her reunion with Brand Reardon, a superior she had always had unresolved feelings about. Ferguson’s story is geared around the Wounded Warriors Facility in Crystal Rock, and anyone who’s read other books in this series will be pleased to find themselves in the company of the veterans and the other characters who make this series come to life so well. And while Two Hearts Unbroken works fine as a standalone novel, I would quite strongly recommend reading each of the books in this series. Ferguson addresses issues that should be relevant to every American -- how rehabilitation efforts affect the future of Wounded Warriors and what needs to be done to help them either remain in service or have access to full and meaningful lives after they retire. She also weaves into her story the extra issues and stressors women in the military face. As with each of those books of hers which I’ve reviewed, I thoroughly enjoyed reading this well-written story and loved once again getting to experience the world of Dragonfly Point and Crystal Rock, and the people who make these special places work. Two Hearts Unbroken: Two Hearts Wounded Warrior Romance, Book 6 is most highly recommended. Two Hearts Unbroken is book six in the Two Hearts Wounded Warrior military romance series by Tamara Ferguson. Two years after being captured and injured in Iraq, Sarah Benton decides to take a military position in Crystal Rock, Wisconsin, initiated for wounded warriors who want to continue serving. Sarah’s leg is now in a prosthetic and her body is healed. Unfortunately, healing her mind is not as easy as fixing her body, but Sarah is not giving up. Lieutenant Brand Reardon rescued Sarah and never forgot her. When these two meet again in Crystal Rock, their mutual attraction rekindles. Brand is determined to make Sarah his wife and he only has a few weeks to do it. Can they heal from their trauma and find the killer who set them up two years ago in Iraq? I just love books with a subplot and Two Hearts Unbroken is one of those romances that deliver the HEA and a thrilling story. Sarah’s story is not just about a soldier fitting in post-war, but of a woman trying to put her life back together after facing the worst horror a female can face. She’s someone you instantly cheer for as a war vet and a woman. Tamara Ferguson provides an eye-opening situation for people who have never been in the military to understand and at least sympathize with wounded soldiers. Sarah is not a Wonder Woman or Black Widow type; she is someone who really needed family and friends to help her along with her healing. The hero was perfect for her and ready to protect her with his own life. I loved that they were a balm to each other's souls in equal parts. 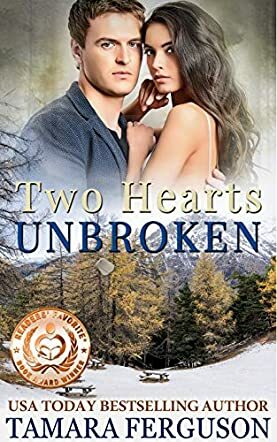 Two Hearts Unbroken is a contemporary romance, the sixth book in author Tamara Ferguson’s award-winning Two Hearts Wounded Warrior Romance Book series. In Two Hearts Unbroken, Airman Sarah Benton is two years removed from being injured, captured, and tortured while on duty in Iraq. She was honorably discharged as a wounded warrior and is preparing to begin a job in Crystal Rock to help retrain wounded military men and women. In the meantime, Captain Brand Reardon, Sarah’s commanding officer and the man responsible for her rescue in Iraq, is also headed to Crystal Rock to consult on the same project. Unbeknownst to Sarah and the other team members, Brand is also there to protect Sarah as evidence surfaces that her convoy was deliberately attacked for reasons other than the war. Tamara Ferguson's Two Hearts Unbroken is a delightful read, one that gently rises above Sarah and Brand’s terrible shared backstory in war to introduce us to Sarah and Brand as a couple. It’s a sweet journey as they get reacquainted with each other and finally admit their latent feelings. The backstory provides a proper amount of dramatic tension and leaves the door open for more. The story is a good reminder of the valor and sacrifices made by the U.S. military as well as a poignant reminder that the work continues once they return home. Sarah, especially, is the quintessential brave wounded warrior, who quickly works with Brand to protect the future they are building together. Highly recommended for lovers of romance and military-based stories.